Vegan Hot Dogs are a Must! Does the thought of a vegan hot dog sound weird? Think again. More and more people are turning to these types of product nowadays and if you consider yourself a hot dog business or have hot dogs and sausages as part of your menu you simply can't go on without adding the vegan hot dog to your list. Please visit our testimonials page to find out what our customers say about us. 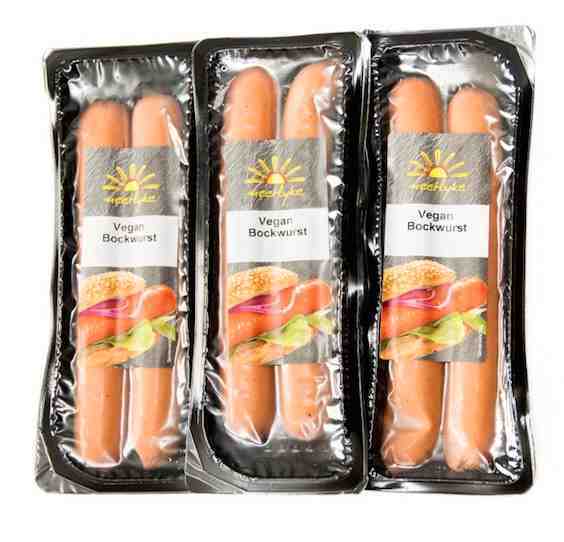 For more information on wholesale vegan hot dogs UK please click on the link. So you haven't incorporated vegan hot dogs into your UK hot dog catering business yet. Are you serious? This is a must! We truly believe adding a vegan option will increase your customer base over time. Also it makes you look like you keep up with the times (see below, reason 3). We most definitely encourage you to add this hot dog to your menu as soon as you can. Give it a try, you might be surprised! Our vegan bockwurst has been made with the utmost care. We are very careful when we choose our providers and with the vegan we have gone the extra mile to import the perfect vegan bockwurst for your business. We love it ourselves, and we are very fussy when it comes to our own products. We never settle for something that's not of the highest standards: our premium products are well known for their top quality ingredients. Let's say we're well satisfied with our vegan hot dog. Full stop. Yes, their might be a long queue of meat eaters waiting their turn to order a juicy, meaty dog but there's no doubt that more and more people are turning vegetarian or vegan nowadays. You simply can't ignore this customer base and if you do it'll hurt your business in the long run. According to this article by The ﻿Telegraph the number of vegans in Britain has risen by 360% in the last 10 years. These are facts that speak for themselves. With over half a million vegans in Great Britain, there's actually three and a half times as many vegans as there were in 2006 according to ﻿The Vegan Society. Also many people like to try different flavours and a good vegan hot dog is an option they might want to taste for a change. Not all meat eaters need to eat meat all the time! Again, we love this hot dog and we highly recommend it. Nowadays it just doesn't look good if you don't keep up with the times. This means not only acquiring the look and design that keeps your customers coming back for more, but also adding to your menu new and exciting products that speak to your customers at the level they're at within their eating habits. There's no doubt that this is a growing trend and if you haven't thought about incorporating vegan products/dishes into your menu this is a good time to get started! We encourage you to try our fabulous vegan hot dogs. If you're a hot dog/catering business in the UK and you want to expand this product is most definitely a must! If you're interested in buying vegan hot dogs with The Sausage Man please find the contact details below.